They are destructive; they are murderers, criminals and rapists. They are cruel and inhuman, they torture and disappear people, and they are corrupt. They are every bad thing you can imagine; they do not care about humanity. They are, in fact, inhuman. Nothing hides what we do, what we want, what we seek; it is all in plain sight. The bad government on the other hand, that is, the three bad powers and the capitalist system, do everything behind the people’s back. 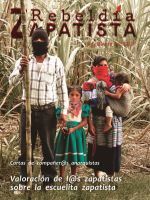 In this first edition of the magazine we will begin to share some of the words and ideas of our compañeras and compañeros who are Zapatista bases of support, families, guardians and teachers, about how they viewed the students at the Little School. Throughout the first editions of our publication we will share the evaluations made by the Little School teachers, votanes, families, and coordinators from the zones of the five caracoles.